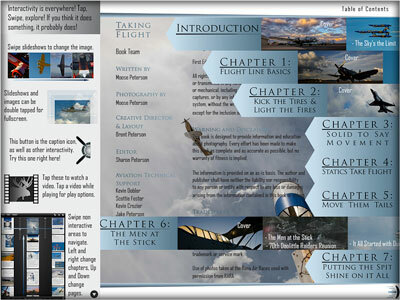 My first AppBook, Taking Flight, written and illustrated by Moose Peterson, I handled the layout and design. 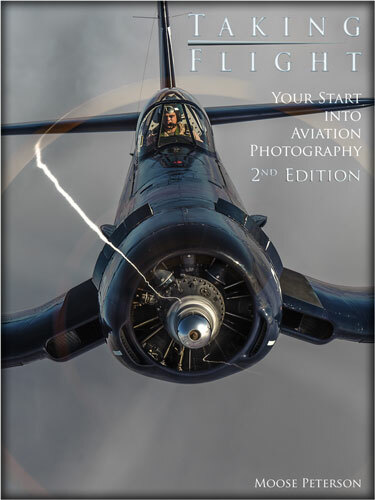 The book focuses mainly on starting in aviation photography, what to look for, and how to capture it once you find it. We even released a free major update to the book. 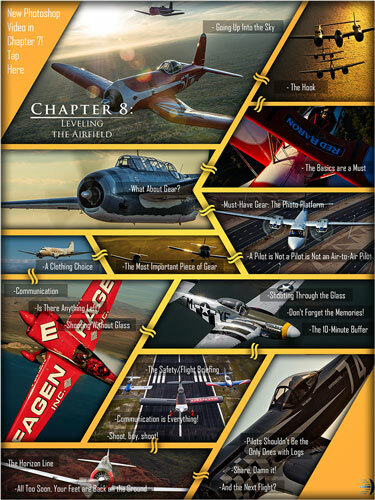 The 2nd Edition comes with a new chapter just on air to air photography. I’ve made a couple dedication pages now. They are pretty important to me to get right. This one is my favorite. 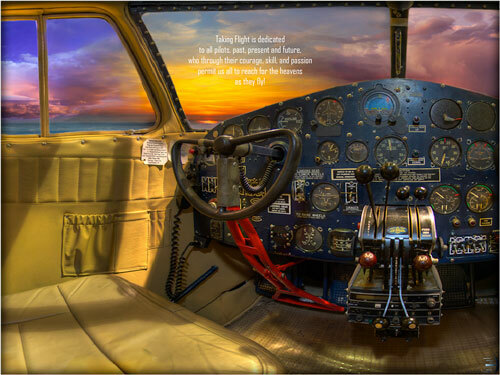 This is a cockpit pano of a Bamboo Bomber that Dad shot and I assembled. And while that makes it cool to me in of itself, I love this page because in the book, the page slowly scrolls across the entire scene. Any one chapter in this book took me as long to create as the Table of Contents. 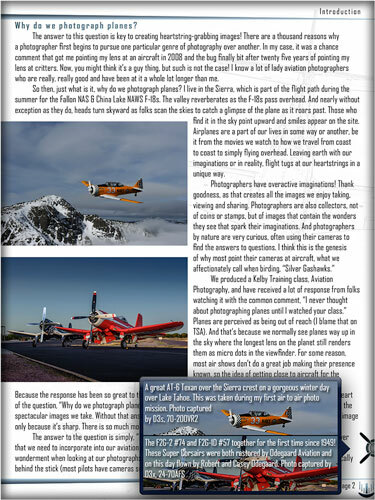 That’s because this single page actually has nine InDesign documents embeded into it to create the sliders. And each of those pages is filled with images, links, and other clockwork to make the magic of this page work. All of these tabs slide out, and nearly anything on this page links to something. With the navigation function being built into every page of the book, allowing you to tap anywhere to pull up the expanded view of the book and jump to any page, the Table of Contents was more about looking interesting and showing off a little, rather than function. Rebuilding the Table of Contents to fit in a new chapter slider was most likely going to cause more problems than solve. So instead I added a new link to the existing Table of Contents that went down to the second page of the Toc, this page. It ended up a neat, clean, and simple solution to the problem. Another one of the great functions in the book is these pop ups provide the means to getting the in-depth captions on how images were shot. 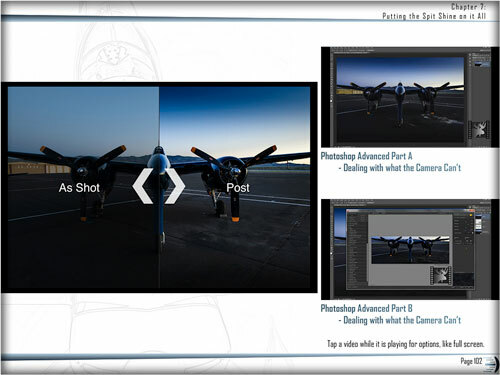 Caption design has always been a challenge with the Aquafadas tools because the caption is just an image, requiring the whole image to be designed separate from the rest of the page, meaning it took trial and error of exporting out the whole page or chapter in order to see the caption’s appearance. Since this was the first book I had laid out (had already done multiple BT Journal Issues at this point but never a book), I put a lot of effort into making the book something unique and interesting graphically. Notice the page backgrounds? Originally I wanted those to be some sort of blue print, maybe from WWII era with schematics of aircraft on them. Well that was a problem because schematics are difficult to find. I also realized that part of what I wanted from that look was the fine details of numbers, dimensions, math, etc, which would not show well on an iPad, especially with other text layered on top of it. Finally I realized I could achieve the look by simply poster edging various images of Dad’s, lowering the opacity, and throwing them behind the text and images. With our update, we made Chapter 7 even more in depth than the rest by adding video of finishing techniques Moose uses on his images. The first part of any page in this chapter is the comparison of the image being retouched, the before and after, with the videos next to that image. The real challenge to the video production on devices in the render, which has to be as small as possible so it plays well and does not use a large amount of space on the device. This required a great deal of experimentation with the bit rate to achieve a small file that still looked good.